They keep sending me these catalogs and they are just wasted on my house of boys. For a brief moment, they got excited thinking it was another toy catalog like Toys R Us for them to circle their Christmas wishlists in. Once they saw it was all dolls, it quickly found itself in the recycle bin. I'm not sure how I got on their mailing list. And do people really pay this much money for dolls? Wow. LOL. With four boys I swould say so. Lol. Definitely not for boys. My sister's kids have over 20 between the two of them, so yes, people do pay those prices! My oldest girl has two that she acquired second hand. She doesn't play with them. She is seven and would rather read and play Star Wars. So there you go. That is a waste to send it to your house, lol. People pay that and so much more for dolls! 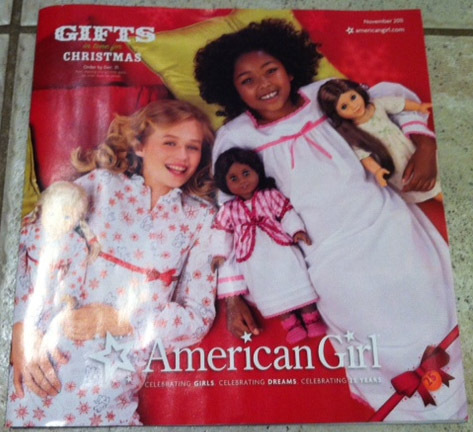 Yes they do pay that for American Girl. I still have mine. She's now 20 years old. Sweet T will be getting her own in a few years. I got that catalog too and was shocked by the prices. My three year old calls it her "magazine" and likes to look through it but thank goodness it hasn't dawned on her that these dolls are for sale. LOL! Not much use at your house. I keep getting all of these catalogs too-yesterday I had 4. Such a waste of paper! I see this is my future! Hayls already loves the smaller american babies! I've seen this catalog as well and holy wow are they expensive! My daughter would never play with it so I don't think we'd ever spend that much on a doll! yeah, I won't be introducing my daughter to these dolls. Way too much $$! I get two of these catalogs every month...not sure why either! My girls would love to have one of the dolls though! LOL - Mine too little yet and I've gotten 3 in the last couple months. Yeah my daughter wants one but there is no way that will happen she has never played with a doll in her life and she is 8.5! Funny. I keep getting multiples of each magazine. That is driving me crazy! LOL! They sure didn't do their research! My girls loved their American Girl Dolls, but yes they are expensive. Luckily their grandparents bought them, not me! Yep, definitely the wrong house! I love your updated look, Marianna. I still have my American Girl Doll (Samantha, my favorite from the books). And my girls will each get their own when they are old enough to properly care for one. Not something you get for a young toddler, so my girls have quite awhile before they get one. LOL yep, those dolls are mega bucks but I refuse to buy my girls one until they are older and can take care of them.